Goal: To understand the benefits and disadvantages of each typology and their relation to one another. Audience: A representative sample and householders. This activity aims to generate discussion and debate with participants regarding housing typologies which have been developed based on the outcomes of the previous dreaming through drawing and modelling exercises. Simple typologies may be based on construction or cultural details, e.g. the amount of stories or land use. Ultimately, the aim is to generate discussion around the different types of typologies, both internally and externally and discuss how these typologies could form the community. Typology models are designed to be flexible to facilitate conversations about participants’ visions and values, e.g. the social implications of each option and individual and communal future growth. 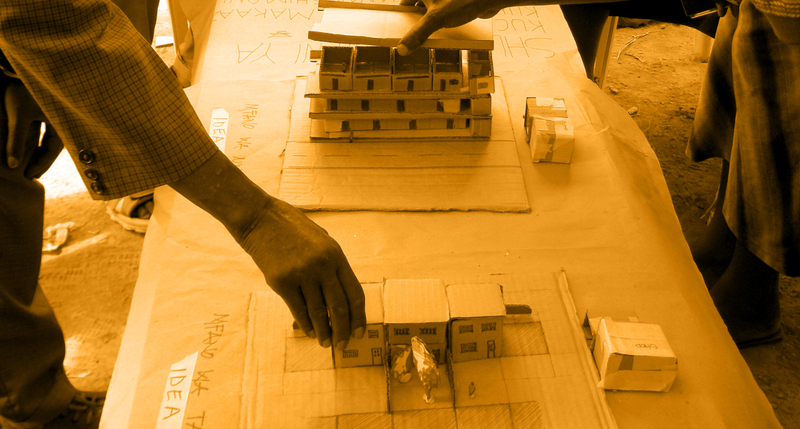 Step 1: Models and drawings used from previous workshops are used to introduce a discussion into typical building typologies and their relationship to one another as part of a community. Step 2: Facilitators should work with the participants to build simple building typologies, made from general details of the ‘ideal houses’. Typologies should be explained in simple terms, i.e. how they were formed based on general ideas of the ideal house. Step 3: Eventually, typologies are defined and relationships between them are discussed.